I wondered if people knew what a water sky was? Water Sky - The dark appearance of the underside of a cloud layer when it is over a surface of open water. The picture above which I took in Antarctica tells the story. First look at the lower foreground of the image. The ice is white, whilst in the distance one can make out what looks like a thin strip of open water. 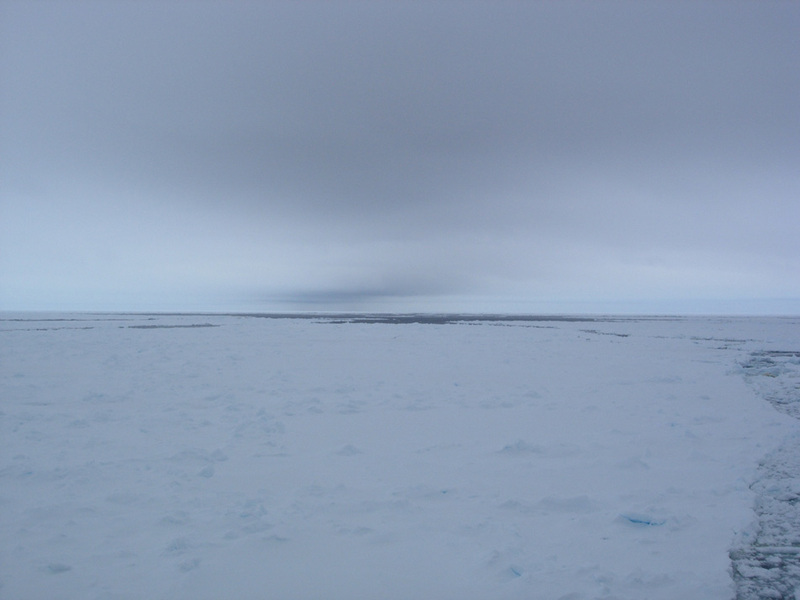 When you have a low cloud base on an overcast day (we sometimes say "manky" in the UK), the reflection of the sea ice on the clouds shows up light, whereas the reflection of the water shows up much darker. Look at the sky in the picture above and you can see that the clouds are much darker on the right hand side of the image than the left. What looks like a thin strip of water is actually the open ocean and the ship is approaching the ice edge. Standing on the bridge of the ship you cannot tell it is the main ice edge - but the reflection in the sky suggests it is. This is stunningly useful in ice navigation because before the introduction of radar it was the only way one could tell if open water was present. The great "heroic age" exploration texts are littered with references to a water sky. This is from M'clintock's The Voyage Of The 'Fox' In Arctic Seas In Search Of Franklin And His Companions in 1859. Thermometer has fallen to 17°F at noon. 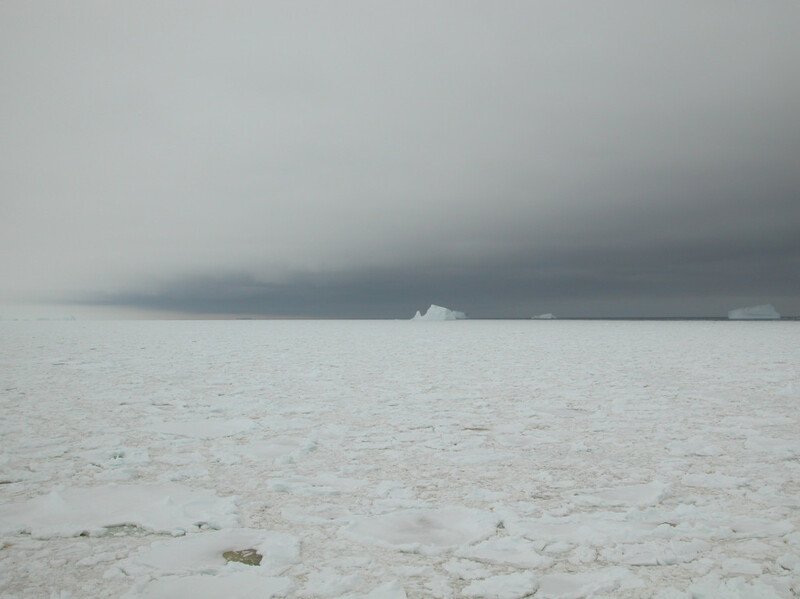 We have drifted 18 miles to the W. in the last week; therefore our neighbours, the icebergs, are not always aground, but even when afloat drift more slowly than the light ice. There is a water-sky to the W. and N.W. ; it is nearest to us in the direction of Cape York : could we only advance 12 or 15 miles in that direction, I am convinced we should be free to steer for Barrow Strait. I said in a previous post that the ice is always moving and the cracks between the ice floes are called leads. There is nothing subtle about the name "lead", the open water between the ice flows "leads the way". How would a lead look under manky conditions? This picture was taken from the bridge of the RRS James Clark Ross heading southwards towards a British Antarctic Survey base called Rothera. In the water sky you can make out a dark line heading south. That is the way you want to take your ship. Just follow the line in the sky. All assuming of course, you can actually reach the open water. In the Heroic Age that was not so simple with underpowered wooden ships. 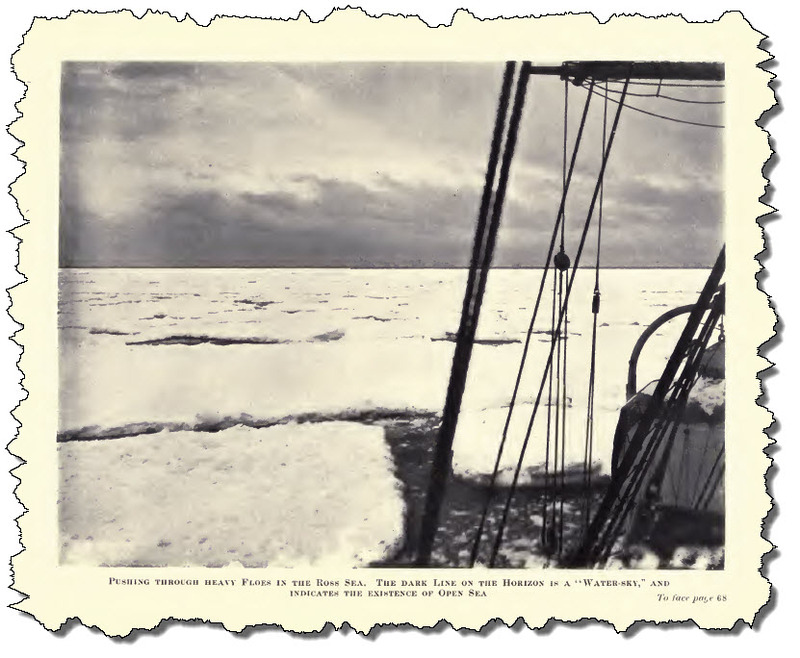 This image is from Shackleton's 1908 Heart of the Antarctic expedition. Shackleton and his crew could see the water sky indicating the open water. The problem was getting to it in their underpowered ship. We admit, however, that it is unknown yet whether any artic (sic) bird species is polarization sensitive. next time I bump into a bird expert may ask them. If you are interested the earliest definition of a water sky I have found comes from this. You can download the book, and on page 76 there is a hymn in the "Esquimaux" language! If you know of an earlier reference let me know. Posted in At sea, Science. Tags: Antarctic, Arctic, polar, sea ice, water sky on April 17, 2013 by Mark Brandon.